Whether you’re new to the transportation industry or an old hand, the terminology we use can be complicated and overwhelming. We get it! 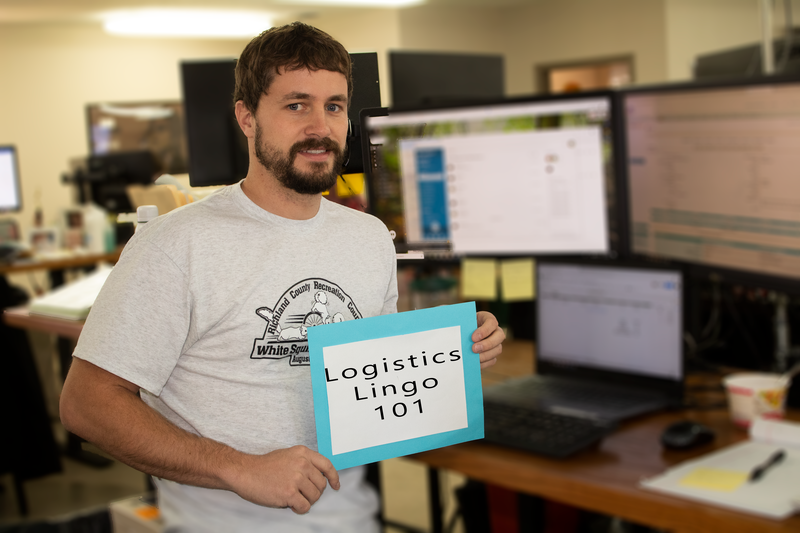 If transportation isn’t your full-time job, you’re bound to need a primer on logistics lingo. After all, you’re too busy to spend your precious time searching the Internet for definitions and explanations. That’s why the logistics experts at AM Transport have compiled a list of transportation terms you need to know. Bookmark this page, or print it out. It’s a handy reference or refresher for the transportation terminology you need to know. A 3PL is a provider who handles logistics services for a company’s shipping operations. Additional charges for freight duties beyond normal pickup and delivery, including: inside delivery, waiting time, fuel surcharges, and detention. A carrier completes a backhaul when hauling cargo from delivery point B back to origination point A. Backhauling is a practice intended to help pay expenses when a truck is returning home. A legally binding contract between shipper and carrier or broker. The Bill of Lading covers the nature of cargo by weight, size, and/or number of pieces as well as the origin and destination. .
Supports–typically lumber and metal bars–used to secure shipments and to inhibit front to rear shifting in trailers. Cargo that is stowed loose for transport. Examples: grain, petroleum, coal, and chemicals. When you talk to brokers or carriers, it’s likely they will talk to you about capacity. Simply put, capacity refers to the transportation industry’s ability to meet the demand for transportation of goods. The driver compartment of a truck or tractor. A company that provides freight transportation services: trucking company, railroad, airlines, parcel express companies. Commodities and freight being shipped. A special trailer or undercarriage used to transport ocean containers over the road. A charge made against carrier for lost or damaged freight. Temperature-controlled supply chain using a variety of means to ensure shelf-life of perishable goods. Damage to contents of package in good external condition. Damage or loss that can’t be determined until package is opened. The individual, company, or location taking delivery and financial responsibility for shipment. Typically the receiver. Typically the shipper (seller) who sends goods to consignee and owns shipment until paid in full. The cost-efficient practice of unloading materials from incoming trailers or railroad cars and loading the materials directly into outbound trucks, trailers, or rail cars with no storage in-between. Carrying capacity of truck measured in cubic feet. Operating a semi-truck with an empty trailer or no cargo. Penalty charges assessed by a carrier to a shipper or consignee, for holding transportation equipment (trailers, containers, railcars) due to untimely loading or unloading. Commonly referred to as a DC, a distribution center is a location where goods are stored until ready to be moved to final destination. The platform where trucks are loaded and unloaded. The Department of Transportation is a Federal Cabinet department of the US Government dedicated to keeping the nation’s transportation systems safe. There is some argument as to whether there driver shortage exists or is actually high turnover. Either way, the American Trucking Association estimates that the US is short about 50,000 drivers and projects the number could rise to 175,000 by 2026. Packing material used to protect freight in trailer. Electronic Data Interchange is the business-to-business interconnection of computers to exchange documents such as purchase orders and invoices. ELDs monitor a vehicle’s engine to capture data on whether the engine is running, the vehicle is moving, miles driven, and duration of engine hours. The ELD rule is a congressionally mandated rule requiring ELD use by commercial drivers who must keep HOS (hours of service) records of duty status (RODS). The rule also sets design status and performance regulations and requires ELDS to be certified and registered with the FMSCA. A shortage or damage noted at the time of delivery and recorded on Bill of Lading before it is signed. Most often used for oversized shipments, a flatbed is an open bed truck with no sides or roof. Federal Motor Carrier Safety Association conducts many activities with the primary mission to prevent motor-vehicle accidents and injuries. A machine used to move goods loaded on pallets or skids. Brokers are intermediaries between shippers with goods to move and carriers with equipment to move goods. Shipments that use the entire truck. Typically more than ten pallets. Extra fee charged by trucking companies or 3PLs to cover the fluctuating costs of fuel, calculated as a percentage of the base rate of transportation. GPS or RFID technology that creates virtual and geographic boundaries, enabling software to keep customers apprised of when a shipment leaves or enters that area. Any materials that may pose a threat or risk to health and safety during transportation. Examples: explosive, radioactive, infections, flammable, toxic, or corrosive substances. Used for moving small or expedited loads, hotshot loads are usually hauled on smaller trailers pulled by heavy-duty pickup trucks. Hours of Services refers to the regulations limiting the number of hours a commercial motor vehicle driver may drive in a given time frame. Transportation using a container that can be transferred between different modes of transportation; for example, rail to truck. Just in Time refers to a system of manufacturing in which parts and supplies are delivered as needed to minimize inventory. A regular freight move from point A to point B. The study of supply chain and the implementation of relevant processes and technologies to save time and money. Shipments that do not require the use of an entire truck. When a driver helps to load or unload at pickup or delivery. A delivery method for mixed loads from different suppliers, utilizing shorter and more frequent routes. Excess freight, more than the quantity shown on shipping documents. The transportation of goods by road, typically in trucks. Drivers who own and operate their own trucks. A detailed inventory or list of items included in shipment. A platform used to package, store, move, and protect goods in freight shipping. Come in a variety of materials (wood, metal, plastic, cardboard). The standard size of a pallet is 40X48. Proof of Delivery is a delivery receipt copy of the signed freight bill at time of delivery. A document, listing all pertinent information related to a load, given to the carrier by shipper or broker. A refrigerated container used to haul temperature-sensitive freight. Freight that must be picked up the day the order is taken or freight that must be delivered the day the order was picked up. The combination of a tractor unit and one or more semi-trailers to haul freight. The consignor or the supplier/owner of the product being shipped. Ranging from reusable steel boxes to corrugated cardboard, these strong containers are used to protect freight during shipment, handling, and storage. A system of organizations, activities, resources, and logistics involved in the production and movement of goods from suppliers to customers. Attached to a truck, a tanker is a cylinder used to transport and deliver liquid freight. A location where freight originates, delivers, or is handled during the transportation process. Terminology used in transportation industry that includes GPS tracking of shipments, location services, notifications of departures and arrivals. TMS is a logistics platform that allows users to manage and optimize transportation operations with greater efficiency. Cancellation fee charged a shipper who cancels a truck. Companies that operate commercial vehicles transporting passengers or hauling cargo in interstate commerce must register with the FCSA and must have a USDOT number. Commercial intrastate hazmat carriers who haul types and quantities requiring a safety permit must also have a USDOT number. Rectangular box container connected to trucks to carry dry freight. The most common type of freight transportation, they are designed to haul pallets or boxes. Here at AM Transport Services, we have a great group of logistics experts who want to help you move your freight. If you have a question about a term or concept not on this list, give us a call. We’d love to answer your questions and learn more about your logistics needs.